I would like a event poster to be designed to target all types of people (multicultural). The theme is 'A Taste of Punjab' ie. 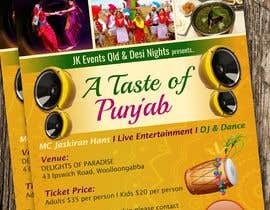 Punjabi food, culture, dance and music. Please add Exclusive Media Partners: Australian Indian Radio and Brisbane Indian Times. If possible then please do it as i am available to do any kind of changes. I can't see the changes you need because you rejected my entry. Is it possible for you to message me the required changes to my personal chatbox?